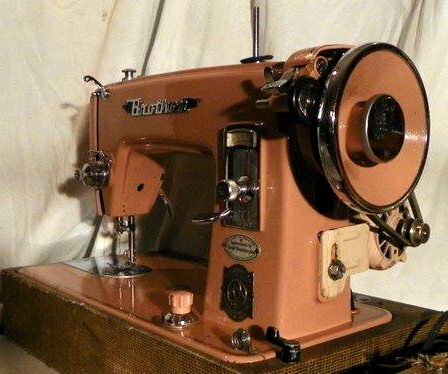 This awesome sewing machine was made in Japan in the mid 1950s. They named it the Window-Matic after it's cool analog stitch-length display window. If she looks familiar, it's because she's the very same machine as the Atlas, just badged differently for a different retailer. As with nearly all of the great sewing machines that were made in Japan in the middle of the last century and, indeed, most Japanese products imported to the US, this is a high quality, precision machine. It's a powerful machine capable of sewing multiple layers of denim or canvas, or even leather, with a powerful motor (about 3 times the power of the motor on the famous Singer 201 - 1.5 Amps compared to the Singer's .5 Amp). Of course it will also sew medium and lightweight fabric just as well. With it's adjustable, dropping feed and it's instant release Patch-O-Matic foot pressure adjuster this is an ideal machine for quilters or anyone who wants to machine embroider, applique, or freehand sew, or who wants to sew sheer fabric without puckers. It uses standard needles and standard class 15 bobbins, available anywhere. It's just come off the restoration bench here at Stagecoach Road Vintage Sewing Machine Restoration and it's running as beautifully as it looks. Between our two technicians we have a total of about 35 years experience restoring and repairing vintage sewing machines. You've seen us on eBay long before vintage sewing machines became as popular and recognized as they are today. You may remember Red Leaf Vintage Sewing Machines or Leisurelander from way back. Our detailer, Aradia, has been with us for about a year, bringing these mechanically restored beauties back to like new appearance. She has the amazing ability to see details that most of us pass over and to get in with her tiny tools and brushes to remove the grime and dust of decades. She's a real master of her craft. Because we believe in these built-to-last sewing machines and in the work we do, we offer this Lifetime Guaranty: If you ever have a problem with one of our restored vintage sewing machines, just bring or send it back to us and if it's something we can fix, we'll fix it for free. You of course will pay for any parts or shipping.